This article goes over how to add users to your school manually and via the bulk importer (available on the Business plan). In the modal that appears, enter your student's information manually (you can add up to 5 at a time). To opt your new students into any emails you may send to them through Teachable, check I confirm these users have consented to receiving emails from my school. To enroll the students in a course, check Enroll these students into a course and use the dropdown menu to select the course. 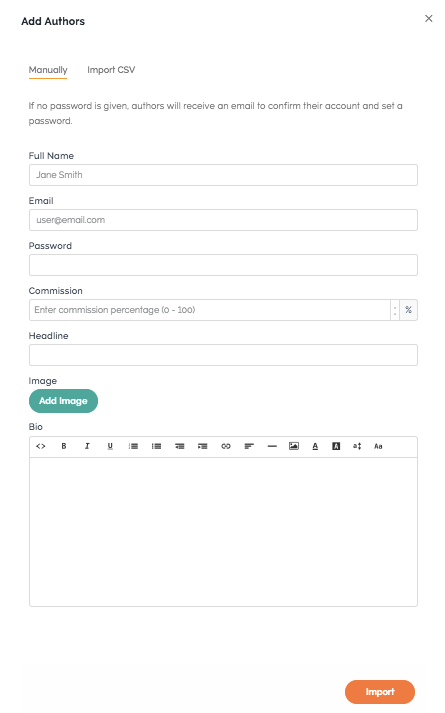 In the modal that appears, add the Name, Email, Password, Headline, Image (we recommend you use a 250 x 250px image) and Bio of the owner you are adding. The email address and password entered here will be the credentials used to log into the author account. Once finished, click Import. NOTE: The Free plan supports 1 admin-level user (owners/authors, including yourself), the Basic plan supports 2 admin-level users, the Professional plan supports 5 admin-level users, and the Business plan supports 100 authors/owners. To directly add a new affiliate to your school without requiring them to sign up themselves, school owners can manually add up to five affiliates at a time, or bulk import affiliates using a CSV (available on the Business plan and higher). To do so, in the Users tab, click Affiliates. Then click the Add Affiliates button: In the modal that appears, enter the Name, Email, Password, and Commission Percentage (for example, if you set Affiliate Commission to 25% for a course priced at $10.00, the affiliate will receive $2.50 for each sale they refer) of the new affiliates. If desired, check the Add affiliate(s) box, and then use the dropdown menu to specify a course. TIP: You can turn an existing user into an affiliate. Primary Owners can manually add additional owners either by adding the owner as a new user or by granting owner privileges to a user that already exists in their school. To do so, in the Users tab, click Owners. Then click the Add Owners button: In the modal that appears, add the Name, Email, Password, Headline, Image and Bio of the owner you are adding. Note that the email address and password entered here will be the credentials used to log into the owner account. If you'd like to enroll the owner into a course, check the Enroll these owners into a course box. Then use the dropdown menu to specify the course they are to be enrolled into. On the Business plan, school owners can create custom user roles with varying permissions. To create a new custom user role, navigate to the Users tab and select Custom from the sidebar menu. Then, click on the Add Custom Users button. A pop-up window will appear where you can add information about the user. Choose from Role drop-down menu to select an existing custom role to apply to the user. School owners on the Business plan have the option of importing an unlimited amount of users via a CSV file. To do so, select the Import CSV option and upload a CSV file by clicking on the Choose File button. A properly formatted CSV should include at least a name and email column. You can choose to add a password column, or commission column (if you're importing authors and/or affiliates). If you'd like to delete a user for any reason, go to their user profile and click the Delete User Permanently button in the Information tab. NOTE: Only the Primary Owner can delete other owners.